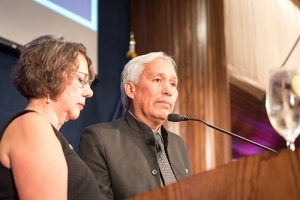 Mexican journalist Emilio Gutierrez accepted the National Press Club Press Freedom award on Oct. 4, 2017. As National Press Club Press Freedom award-winner Emilio Gutierrez and his son, Oscar, marked one month in detention at the hands of U.S. Immigration and Customs Enforcement, the number of signatures on a change.org petition calling for his release more than doubled over the weekend to nearly 65,000. The latest uptick comes after National Press Club Executive Director Bill McCarren joined Rep. Beto O’Rourke, D-Texas, and other press advocates last week on a Texas public radio broadcast about the plight of the Mexican journalist, who has been trying for nearly a decade to win asylum for himself and his son in the United States after his reporting on official corruption made him the target of death threats. It also follows a weekend appeal by Reporters Without Borders to its followers to support the #FreeEmilio petition. Last summer El Paso immigration Judge Robert Hough ruled against the asylum request, contending that Gutierrez had not presented sufficient evidence that he was a journalist, and arguing that Mexican authorities could protect him. On Dec. 7, ICE agents attempted to deport the two men but were stayed by an emergency order from the Bureau of Immigration Appeals. That agency has agreed to rehear the asylum case. No rehearing date has yet been set, however, and ICE so far has refused to allow Emilio and Oscar to return to their home in Las Cruces, New Mexico.